Oracle change a little on installation file. OUI does not copy files to Oracle Home You just extract the zip file to Oracle Home directly and OUI only linking binaries. I installed Oracle Database 18c on Linux 7.1. Before installation, I set Oracle environments such as (ORACLE_HOME, ORACLE_BASE). You can add these settings in oracle user .bash_profile. As you know that we can repeat our previous SQL*Plus commands in Windows CMD. But in UNIX based systems not supported command line history of SQL*PLus. For this reason in UNIX and Linux, we used rlwrap utility to see the SQL*Plus command line history and quickly recall previous SQL*Plus commands. With seconds release of Oracle Database 12c coming SQL*Plus history command for the history of the command line in Linux. OTN EMEA Tour 2017 took place. Our city Baku also included this tour this year also. We (board of Azerbaijan Oracle User Group) organized the biggest event at Baku (Park in Hotel) by sponsored Azercell Telecommunication Company. This year 3 Oracle ACE Director Bjorn Rost (Germany), Gurcan Orhan (Turkey), Heli Helskyaho (Finland) and an Oracle ACE Rene Antunez (Mexica) are our guests. Attendees of our event listened very interesting Oracle technical topics at the event. See you next year at Baku. Today is OTN Appreciation day. In this reason Oracle bloggers share a blog post about himself favorite Oracle feature. This great idea coming from Tim Hall (@oraclebase). I also want share my favorite feature of Oracle Database. Here’s my contribution to the OTN Appreciation Day. How to Oracle working? - this question is interesting all of persons which is using Oracle database. Oracle trace files is very helpful for learn working mechanism of oracle processes. Each server and background process writes to a trace file. When a process detects an internal error, it writes information about the error to its trace file. As you know, Oracle Open World 2016 conferences continue at San Francisco (September 18-22, 2016). There have very interesting little guide for new features of Oracle Database 12c Release 2. I want share something about released new feature of Oracle Database 12.2. Oracle Application Express is (first name is HTMLDB 2.0, I used it at 2005 year) very interesting tool for developers. This tool for helping to create applications very rapidly. Oracle Application Express 5.0.4 is latest version, released on July 12, 2016 and Application Express 5.1 Early Adopter 2 now available. I attended TROUG Days 2016 Istanbul which is organized Turkish Oracle Users Group as a speaker. It is very amazing conference. I meet my friends during conference. OTN Article: Oracle Database 12c: "Colección automática de estadísticas para cargas masivas"
Oracle Technology Network continue publish our article. My next article published OTN Latina in Spanish language. My special thanks my friends Joel and Sebastian ! 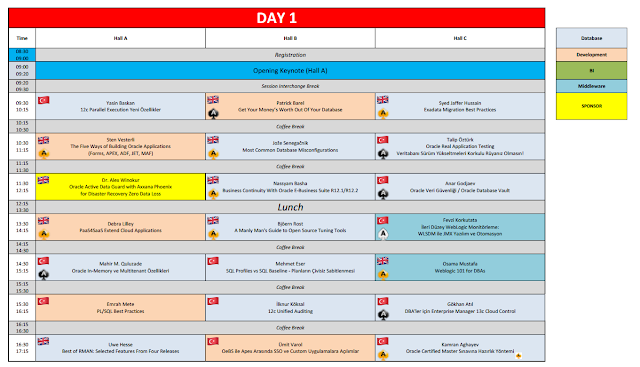 TROUG Days Istanbul 2016 Agenda is online! I'll speaking at TROUG Days Istanbul 2016, Apr 28th, 14:30 Hall A, ITU Teknokent. My topic is Oracle In-Memory with Multitenant. See you at TROUG Days Istanbul 2016! First meeting of AZEROUG in 2016 year! 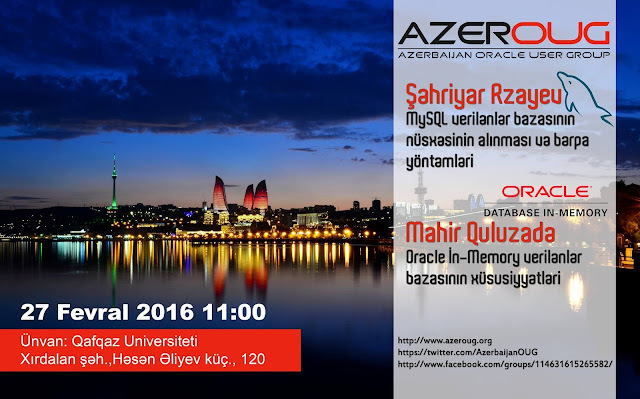 I'm speaking at AZEROUG (Azerbaijan Oracle Users Group) Meeting February 27th, 2016 at Qafqaz University/ Baku, Azerbaijan. 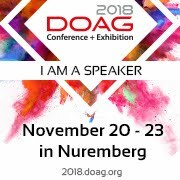 I'll speak about amazing Oracle Database option In-Memory. OTech Magazine issue Winter 2015 is the tenth – and last – issue of OTech Magazine – the independent Oracle technology magazine. In this last issue of OTech Magazine we offer you 10 highly technical articles on Oracle technology. 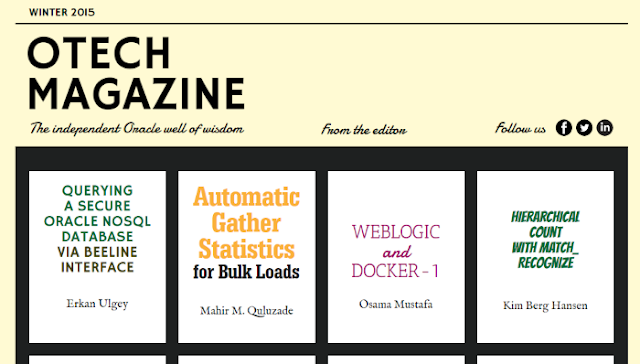 My "Automatic Gather Statistics for Bulk Loads" article also published in this issue. Automatically gathering statistics enhanced within Oracle Database 12c Release 1. My article covers this feature of Oracle Database 12c Release 1 with examples of automatically collect statistics of objects when bulk load operations. My special thanks to my friend Douwe Pieter van den Bos (owner of OTech Magazine) for all efforts. It is my first article published on OTN Latina after awarded Oracle ACE. My special thanks to my friend Oracle ACED Joel Perez (Venezuela) for all supports. Oracle Technology Network Latina started publish our new article series about Oracle Database In-Memory. This articles is first about In-Memory in OTN Latina articles. First and Second parts of Oracle Database In-Memory article series published in 2 language (Spanish/Portuguese) same time. My special thanks to Joel Perez (Venezuela), Flavio Soares (Brazil) and Sebastián D'Alessandro (Argentina). As you know, Oracle Magazine July/Aug 2015 issue released. You can free subscribe to Oracle Magazine digital edition and you can read here or you can read technical articles here. I subscribed Oracle Magazine, in current issue have very interesting articles. In this article Tom talks about Cost Based Optimizer and shown how optimizer learning from mistakes. I don't want review this article, but there have about interesting new feature of Oracle Database 12c. 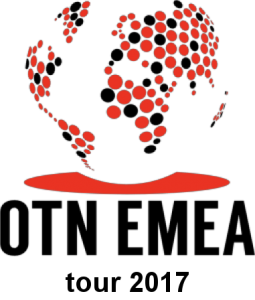 Oracle Cloud provides several Oracle Database offerings. Choose between a single schema based service, or a virtual machine with a fully configured running Oracle Database Instance, or Exadata Service with all the database features, options, and workloads. Oracle Cloud Provide Database schema Service as: 1 Schema on Oracle Database 11g I don't know, can we request on Oracle Database 12c Release 1. 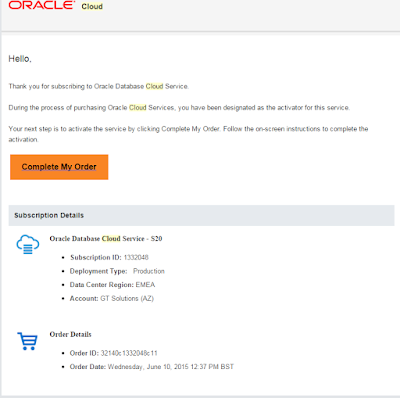 But I think in the future can provide on 12c version Choice of 5, 20, and 50 GB database storage (1GB for trial account) I subscribed to Oracle Database Cloud Service. OTech Magazine Summer 2015 Issue #8 Released! 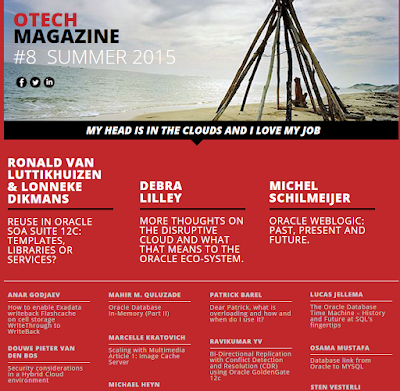 Independent Oracle Technology Magazine OTech Magazine Summer 2015 Issue Released. 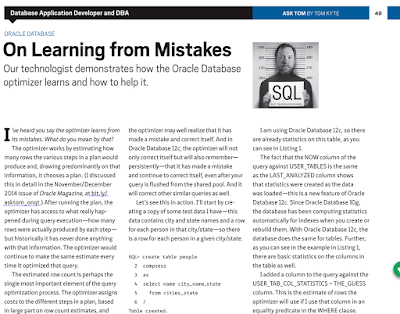 Second part of my Oracle Database In-Memory article series published in this issue. I want thank to all author for all efforts. My special thanks to Douwe! 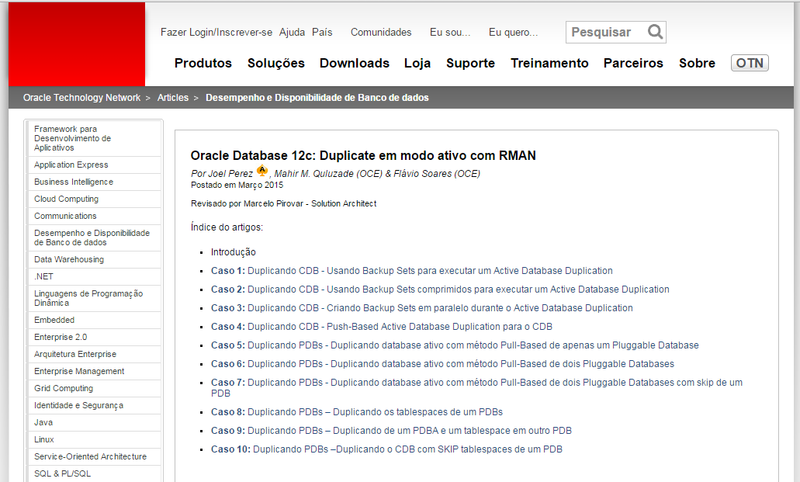 Oracle Technology Network - OTN Latina published our "Pull-Based Active Duplication with RMAN" article series this month in Spanish Language. This article series covers new option of duplication with RMAN on Oracle Database 12c Release 1 (12.1.0.1) in 11 parts. Oracle Technology Network - OTN Latina published our new article series this month in Portuguese Language. This article series covers new option of duplication: Pull-Based Active Duplication with RMAN on Oracle Database 12c Release 1 (12.1.0.1) in 11 parts.